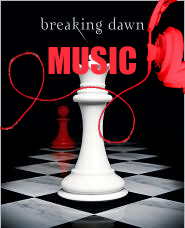 This is a page dedicated to the music related to Breaking Dawn! So start listing/ emailing your songs! Make sure to specify what book the song goes with. Forever by Fireflight, This song IS the Twilight series! I have to hear it in Breaking Dawn! Ive got some good ones but make sure if you listen to them u r reading the lyrics at the same time!! They are all perfect for it even if you dont like the artists have a listen!!! I wrote a song and recorded it last weekend. Does anyone know who is producing the new soundtrack for Breaking Dawn? Digital Bath – Deftones would be an amazing track to hear in that film! Suburban Decay by Adam Lambert!!!!!! It would be beautiful to have Carter Burwell’s “Bella’s Lullaby” in some part of Breaking Dawn. The music would come full circle. Go team Carter! I just heard Forever by Fireflight…should be in BD for sure. I heard this song recently and it should be on the Breaking Dawn soundtrack. I think the song would be perfect for the part when Edward injects Bella with his venom. The song is called Real Life by The Lyra Transmission. i think this song would be wicked on breaking dawn when Bella is changing from human to vampire. its one of my friends songs and just think it has that ethereal feel to it. Two thumbs up! I love it! I like the song “Someday (I Will Understand) by Britney Spears. It`s describes Bella throughout her pregnancy. And “This I Promise You” by Nsync describes Edward and Bella`s relationship, over coming obstacle after obstacle. Through good times and bad. It`s also a great song for them to dance at their wedding. i think of this song! oh and it’s perfect for breaking dawn! Aftermath by Hurt – the scene Edward is giving Bella the venom. Totally AGREE about ~Someone Like You by Adelle~ I think it’s perfect for that part or when Jacob shows up at the wedding! It totally describes the end of Jacob&Bella! Can’t wait for these movies but am sad it’s the end 🙁 Would love to see Stephanie continue on with Jacob&Renesme that would be awesome! and the whole twilight series for that matter! just google the lyrics and you’ll see what i’m talking about! on breaking dawn when Bella is changing from human to vampire. Evenescence – Bring me to Life is the perfect song. I would love to see Evenescence ( Bring me to life) and others she has done. it will rain. by bruno mars. I know it is actually in the film but I think it would suit when Bella and Edward are just on the island. Listen to the song and see if you agree with me. Log in | 54 queries. 1.098 seconds.